Denis Blackham has been mastering music since joining I.B.C. Studios in 1969. For 27 years he cut vinyl, signing the dead wax as BilBo (3). Some 45 releases have 'A Bilbo Boppa' etched. Since 1989, he has concentrated on CD mastering. After leaving I.B.C. in 1973, Denis worked for various companies including Phonodisc Ltd., RCA Studios, London, The Master Room (1976-77), Nimbus Records (1977-78), Tape One (1978-89) and Porky's Mastering. In 1996 Denis started his own Country Masters facility at his Surrey home. 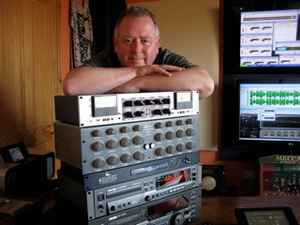 In 2002 he moved to the Isle of Skye and changed his company name to Skye Mastering. Despite announcing his retirement from mastering in May 2014, Denis has since announced that he is "semi-retired" and continues to work on selected projects.